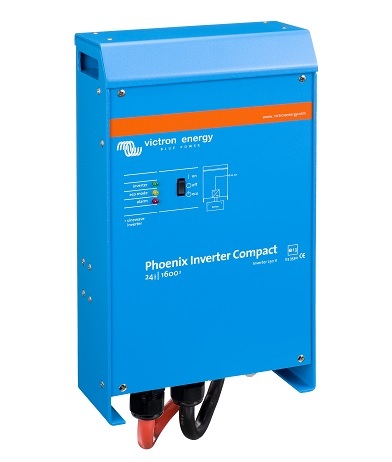 Victron Energies' Phoenix range of Pure Sine Wave Inverters are suitable for applications needing reliable and high quality pure sine wave power. Use these inverters to invert 12V, 24V or 48V DC sources to 230V AC supplies. Thay can be used in many applications including; Renewable Energy Systems, Motor Homes, Caravans, Boats, Backup Power Systems and anywhere that DC sources need to be inverted to AC supplies. Use the options in the dropdown menus below in order to select the DC Voltage and the Power Rating required. Click on the “ADDITIONAL INFORMATION” tab below to see the available options for this product. Developed for professional duty, the Phoenix range of inverters is suitable for the widest range of applications. The design criteria have been to produce a true sine wave inverter with optimized efficiency but without compromise in performance. Employing hybrid HF technology, the result is a top quality product with compact dimensions, light in weight and capable of supplying power, problem-free, to any load. Models range from 1200VA to 2000VA per module.